Since the death of doyenne Brooke Astor, the longtime queen of New York Society, those who care about such things have wondered and discussed who might be her successor on the throne—or if New York society could even be ruled again by just one person. About all this I know little, sitting up here in Down East Maine, where paying the oil bills or the declining price of lobster worry one far more than who will preside over the leaderless elite of Manhattan. An auction of Mrs. Astor’s lesser effects was held three weeks ago at Stair Galleries in Hudson, New York. 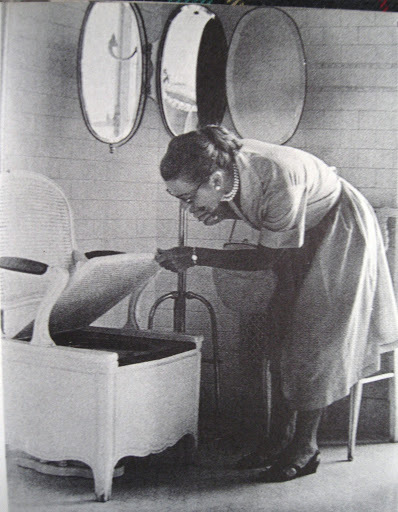 Her leftover possessions were typical goods of a well placed lady of the second half of the 20th century—pretty and decorative, with a French accent. Several friends and acquaintances attended the auction, and depending on whom one asks, and what they hoped to buy, prices were either terribly high or terribly low. My own observation is that the sale followed the current market—where style and eye appeal trump age or quality, or even provenance— many of the pieces were chosen for her by Parish-Hadley. I scratched my head at some of the prices—$5500 for a Metropolitan Museum reproduction of St. Gauden’s iconic statue of Diana—available in the Met Gift shop for considerably less—-down to a mere $15.00 for the Louis XV style Chaise Percée pictured below. 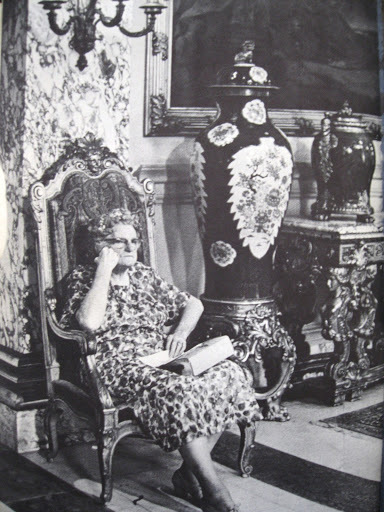 I was immediately reminded of another wonderful Sirkis photograph, of an elegant woman examining a chaise Percée in a bathroom at ‘The Elms’. And then, it came to me: The new owner of this chair is now the possessor of Mrs. Astor’s throne. Society need wonder no longer. Undoubtedly the bargain of the sale, in my book. Oh you are bad! haha2 years ago we had a project which had an old chaise Percée and the contractor THREW IT AWAY. I was so mad! LOL Not that I particularly wanted it for myself but it was just so cool. Apropos of Queens and Thrones:I've just noticed the recent potted obit in NYSD of Brunie McKnight. There's this particularly pathetic passage:Born at the tail end of the Gilded Age, Brunie was brought up in what was known as Society in New York where names and phone numbers were listed in the New York Social Register and family history extended back a century or more. It was a very small world in many ways, although newly “liberated” by the women’s movement, where people grew up together, married, started families and mingled with (mainly) their life long friends and neighbors. "Brunie lived to see that world and its traditions completely altered and stripped away. If it troubled her, she never let on. She considered herself a modern woman and bore some of the characteristic of her early ancestor Mrs. Mott. [Punctuation corrected. ]This is "characteristic" of the rubbish that now commonly appears about "Society." Particularly on the internet.That old world is still largely intact, and the world of the people who inhabit the picture pages of the The New York Social Diary is infinitely more transient. A real conversation piece, although I'm not sure I would like to take part in that conversation. Someone I missed this in the flurry of a Salem October: such a perfect little post!